Pingala Software is known for providing cutting-edge futuristic technology solutions to businesses worldwide. The most sought after Blockchain technology has no exception to this focus. Knowing the potential and addressing the demand of our customers, we have built in-house competency to realize the full capacity of this revolutionary new technology. 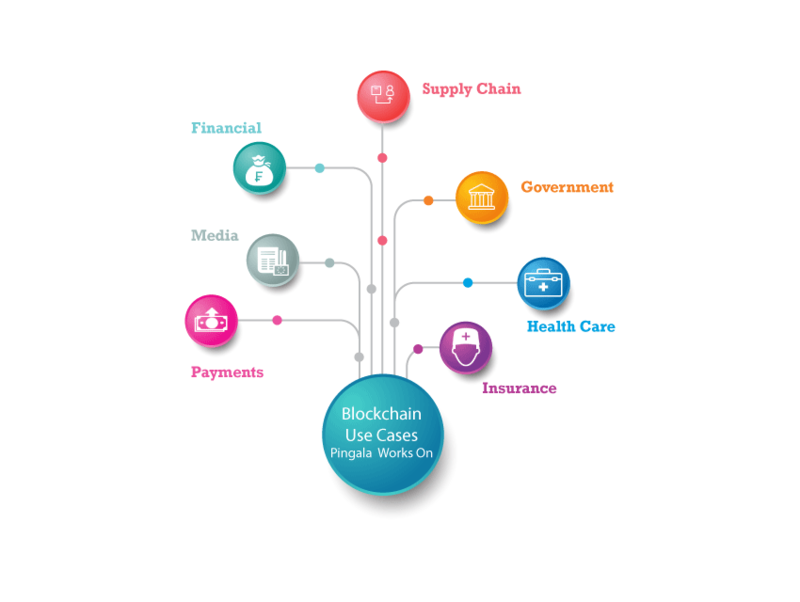 Leverage the benefits of blockchain technology with Pingala Software – an expert blockchain application development services company. Blockchain is a revolution and its the future. Blockchain technology works on the concept of distributed/decentralized network which has a large potential to transform business operating models in the long term. Like a regular transaction ledger in accounts, Blockchain is a digital record of the transaction for Crypto currencies like Bitcoin or Ethereum. Information stored in a Blockchain is secure as it is difficult for anyone to delete or make any changes once the transaction is commenced. At Pingala software we offer end to end blockchain development services starting from ideation to design and coding to finally launch, we handle complete dApp development process covered from start to finish. We have some of the best blockchain app developers in the industry in our team, who knows blockchain technology in & out. We love blockchain and our team is here to provide you with ongoing development support for all our blockchain products. We at Pingala software come up with a project with use of blockchain in land registry is primarily being explored for its potential to enable the "almost instant" transfer of property securely. With smart contracts enabling self-execution when certain conditions are met transactions could be completed faster. For example, a rule could be put in place to facilitate the title of a property being automatically transferred to the new owner when they deposit funds to the appropriate account. Ledgermail is a blockchain based unique implementation of email communication redesigned, which avoids any flaws in existing email protocols by looking at email communication from a very different perspective. Ledgermail is implemented with the help of intensive research done on existing security flaws in email protocols and how can a most secure email service be built to benefit organizations and governments. Supply Chain involves multiple parties/partners working on the same goal with low trust, where each one maintaining their own database. There is no trustful process to trace the product life cycle when something goes wrong. Blockchain makes it easy to trace product lifecycle by creating shared, secured and immutable ledger, where all the relevant parties can see real time data across the supply chain. This POC tracks the product in the supply chain, makes an entry to Blockchain about the asset state in each phases and anytime if the process is out of compliance then the contract will be canceled. If everything goes as per the agreement then product will reach the destination and money will be credited automatically. Companies like Maersk, Walmart, Nestle, AIG are researching Blockchain to solve improve their supply chain. We at Pingala software come up with a project with use of blockchain in Airport boarding Pass. With boarding pass being digitized over a Blockchain network, more trust and security can be implemented into the process.